Rigid body enables simulation of physical bodies in accordance with rigid body dynamics. This type of body is the most commonly used and the most efficient in terms of performance. 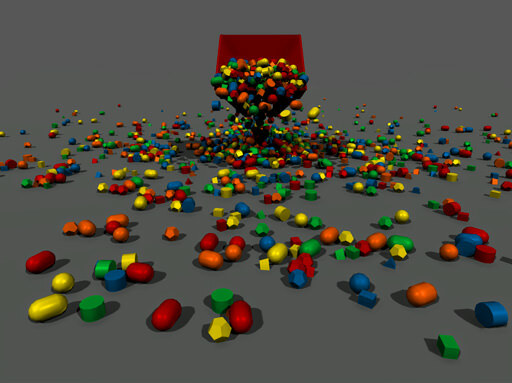 A rigid body must have at least one collision shape assigned. 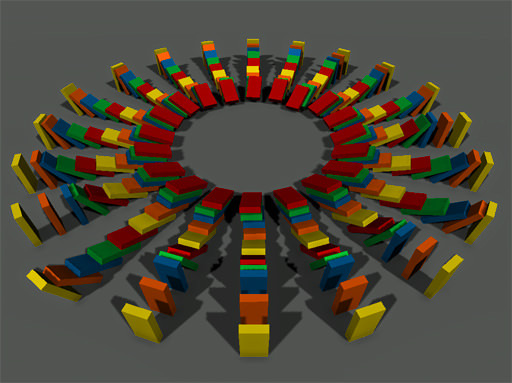 Volume of a rigid body can be approximated by several shapes (e.g. a concave object divided into a set of convex hulls or a ragdoll body). Each shape has its mass and density. Therefore certain parameters of a rigid body, such as its total mass, center of mass, and inertia tensor, are determined by its shapes. These parameters can be calculated automatically if Shape-based mass parameters option is enabled. 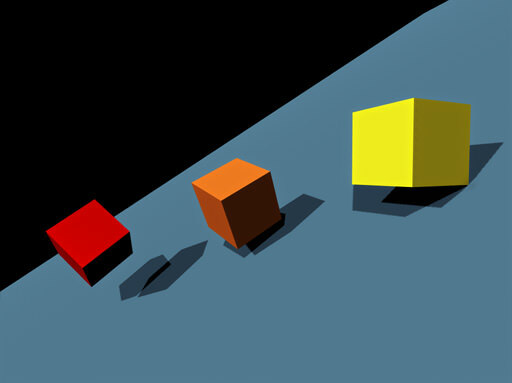 Select the desired object with a rigid body assigned. Go to the Physics tab in the Parameters window. In the Body section check Shape-based option. Setting the individual masses or densities of the shapes is the most intuitive method to achieve correct physical behavior of the body. Even if overriden by body parameters, they are still used to determine the distribution of mass within the object. Disabling the Shape-based mass parameters option makes it possible to manually redefine some total parameters for the body. In the Body section check Shape-based option. The fields of total parameters for the body will be activated. Set up body parameters manually. An arbitrary point can be set to be a center of mass of the body. It may be necessary to correct the motion of an object to provide desirable look. For example, a tilting doll with a sphere shape requires an uneven mass distribution: its center of mass should be located closer to the bottom, so it always stands up when tilted. Center of mass is set as coordinates of the point in local space of the body. The moment of inertia is a rotational analog of mass, describing the resistance of the body to rotation in different directions. It is determined by the distribution of mass throughout the body volume. The farther from the axis of rotation the center of mass is, the more rotational inertia the body has. where Iij sets the moment of inertia around the i -axis when the body is rotated around the j-axis. To rotate the body evenly about the rotation axis, the matrix should be diagonal, i.e all values outside the main diagonal are set to 0. Otherwise, the body may start to rotate chaotically. The higher the value, the more torque must be be applied to rotate the body about a particular axis. The lower the value, the easier it is to change the angular velocity of a body about a particular axis. It is not recommended to set values less than 0.011! Otherwise, the matrix won't be properly inverted, which is necessary to apply collision impulse. Values are corrected with respect to the average value to provide smoother movement. Because of that, it can only slide down when falling upon the tilted plane. The red box, on the contrary, has the lowest inertia and rotates most eagerly. If a Freezable flag is set for a rigid body, its simulation is freezed when necessary. Freezable flag is recommended to be always set for all rigid bodies except for Player Actor. Freezing a player causes it to react to the user's input with a time lag, small but nonetheless perceptible. Select an object to assign a rigid body to. Go to the Physics tab in the Parameters window and assign a physical body to the selected object by selecting Body -> Rigid.